I am really excited to be sharing this recipe (actually it is more of a technique with a really cool kitchen gadget) with you today. I'm so excited, I don't even know where to start talking about this recipe. This is the real deal. No cream, no half-and-half, no flour-- just corn and a little bit of butter☺. Whenever I see recipes calling for anything other than corn and butter that are called creamed corn...I can't help wincing. It's not that I am the guardian of the concept or anything. I just like to keep those flavors in other dishes like the Creamy Corn Pudding Soufflé. 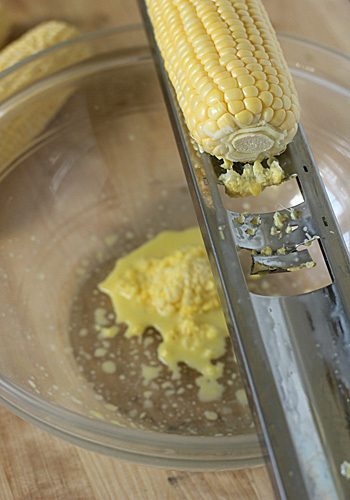 As a child, I spent hours sitting on my grandparents' counter top watching them cream corn. As I got older, I spent my fair share of time and labor shucking bushels of corn so we could freeze it for the fall and winter (it is a must on our Thanksgiving menu). In college (and without the really cool gadget), I even went as far as creaming the corn by hand. The creaming process begins by cutting down the middle of each corn row with a sharp knife. 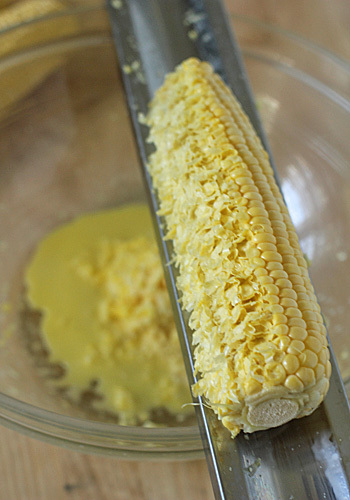 Then using the back side of the knife, you extract the corn pulp and milk. This process can produce equally delicious results, but it is far more labor intensive. My dear grandmother took pity on me when I told her how I was going about it and I had a corn cutter of my very own in the mail that week! And that cutter is working just as well now as the day I broke it in. The teeth and straight edge on the cutter. 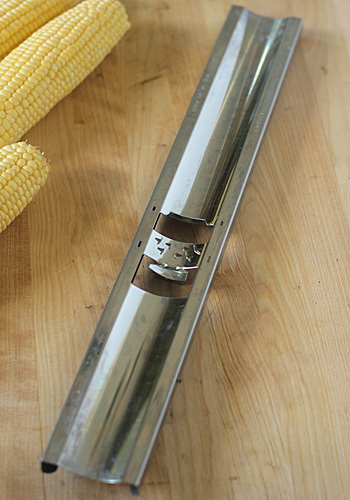 to extract all of the corn pulp and milk. Give the corn a little turn and repeat, turning after each pass, until the corn has been completely creamed. 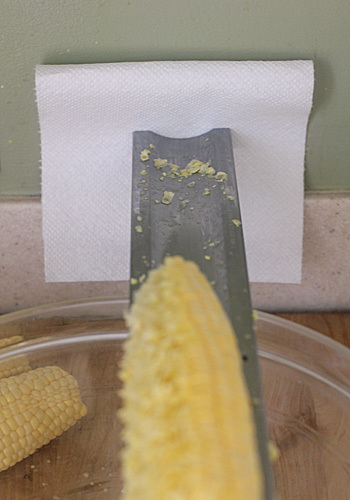 Quick tip-- place the end of the corn cutter up against a wall covered with a towel. This will help you keep the bowl and cutter in place. Also, remove anything close by as the corn will splatter slightly as you cream it. 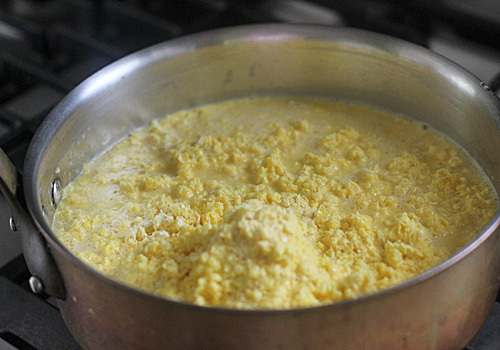 Cook over the lowest heat setting with a little bit of butter, covered, for several hours or until starches have naturally thickened the creamed corn and the color is a deep golden yellow. Season with kosher salt to taste and you are good to go. 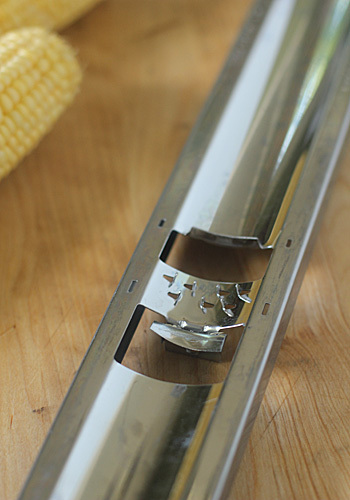 I am fairly certain that many of you don't have a corn cutter. So with fond memories of my grandmother's intervention, I am going to spread my own gospel of corn creaming and give away not one, but two corn cutters to my wonderful readers and followers☺. To enter for a chance to win, leave a comment in the comments section below describing your favorite recipe using corn. For a second chance, leave a separate comment below telling me you follow me on Facebook. The winner will be randomly chosen. This giveaway, sponsored by yours truly, will be open until Monday August 27, 2012 (open to U.S. and Canadian residents only). The winner will be announced next Wednesday August 29, 2012. Good luck! 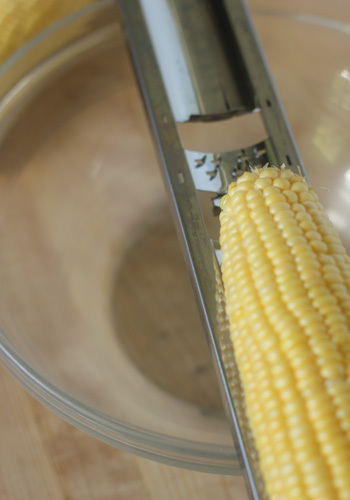 Using a corn cutter, cream the corn over a large bowl. (The creamed corn can be frozen in flattened, freezer safe zip-top bags for up to 6 months. 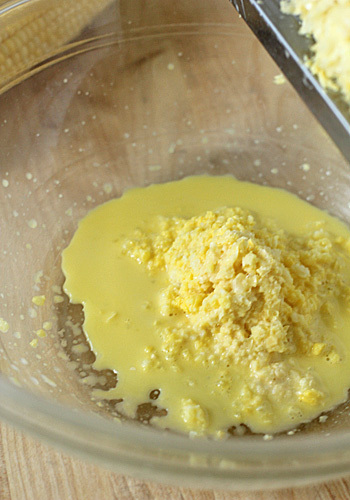 Thaw completely in the refrigerator before continuing with the recipe). Transfer the corn to a large saucepan, then add the butter. Bring the mixture to a simmer, stirring constantly. Reduce the heat to low, cover, and cook, stirring occasionally until the corn has thickened and is a deep golden yellow, about 3-4 hours. Season to taste with kosher salt. Enjoy! Source: My grandparents, Dr. and Mrs. Aaron Heide Davis of Greenville, S.C.
i love fresh corn salad with black beans and salsa! I love to make your Summer corn salad with manchengo and lime ~ and since it always feels like summer here in FLA it goes with everything!!! I also like a good black bean and corn salsa since we eat a lot of mexican food! I follow you on FB and Pinterest! I just love fresh corn. When you say creamed corn with only a little butter, my eyes lit up. Sounds fabulous. I have not heard of this particular gadget and can't wait to try it although I have tried other cob cutters and none worked as well as a sharp serated knife. Of course, that's for just getting the corn off the cob--not what you are doing. BTW, have you seen the video of the old man who microwaves corn in the shucks, slices off the end and slips the cob out without any silks in sight? I tried it and it works! I follow you on Facebook too. Also like fresh corn saute until a little brown in butter only. I love using creamed corn in a corn pudding recipe that I acquired several years past and now make it every Thanksgiving holiday for my family. Being from the Midwest the best way to eat corn is straight off the cob! That is one cool looking gadget though. I love to make a grilled Corn, Zucchini and quinoa salad, so delicious and good for you too! I also use fresh corn in a spicy corn dip. Yum! I liked you on FB, what a neat page!! My favorite recipe using corn is a Mexican(ish) bean and corn casserole with spicy tomatoes and lots of cheddar cheese - it's delicious by itself or served with chips and salad toppings, like a taco salad of sorts. Best of all, my 5 kids all love it. The best way to enjoy corn - right off the cob! I grew up eating fresh picked sweet corn from my grandparents farm. The best way to cook it - place in cold water with a splash of milk and a spoonful of sugar. Cooking it in salted water will make the corn tough. I follow you on FB and Pinterest, loved your corn post!! I loved this post. I love corn in all its forms. My grandma had a cornfield out her back door in West Virginia. Silver Queen. Corn afficionados...know what that is. Every winter we took out containers of this sweet creamed corn from her ancient reach-in freezer. This brought back some happy memories of that farmhouse and my Nanny. I follow you on facebook & subscribe by email. My favorite way to eat corn is fried corn with 1/2 and 1/2 regular corn and creamed corn, bacon and salt and pepper. Easy, simple and delicious. I love to make Ina's corn salad, so good! One of my sweetest memories is of my mom making creamed corn for dinner. She did it the old-fashioned way, how she would have loved this gadget. I'm happily subscribed by e-mail and facebook and pinterest. I just love corn pudding with red peppers. Thanks for the giveaway! Creamed corn. Period. My mom (raised in Mississippi) always makes it (the way her mom from Mississippi does) whenever I come to visit. I think creamed corn is best when served with black eyed peas and cornbread (not that godawful yankee kind with the sugar though, gross) and the three items blend. I love it and every time I eat it the memories flood in for me, and I know they do for my mom too. She always tells me about when she and one of her sisters would sneak into the fridge late at night to get into the leftover, cold creamed corn. My mom and I don't fight over it like that but we've both been known to eat it for breakfast. I love making a corn and avocado salsa! So delicious! 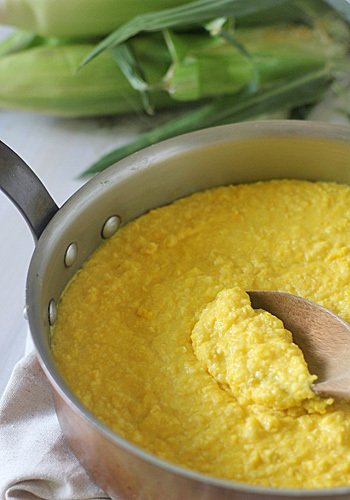 I love corn cakes, but I'm excited to try homemade creamed corn - I've only had it from a can! straight off the cob, boiled or roasted. I love enjoying the unadulterated sweetness of the corn itself. I'm a purest. I love love LOVE Corn-on-the-Cob, boiled 10 minutes... no salt or butter... just amazing CORN... I'm making myself hungry. A close second is corn from the cob, freshly cut off. My favorite is mexican corn chowder. I love corn on the cob, cornbread, tortillas..you name it. This is, again, the summer of corn and tomato pie. It's so good but I need to turn it into a cobbler to make it simpler but first need to incorporate cornmeal into the dough. Maybe just use cornbread batter? I'll figure it out! Love creamed corn, too. Have a recipe from Cooks Country that sounds similar to yours. I imagine you can cook this in a Crock Pot, ya think? Corn and macaroni casserole, from my grandmother. My favorite is cornbread! Especially when they are cornbread muffins. 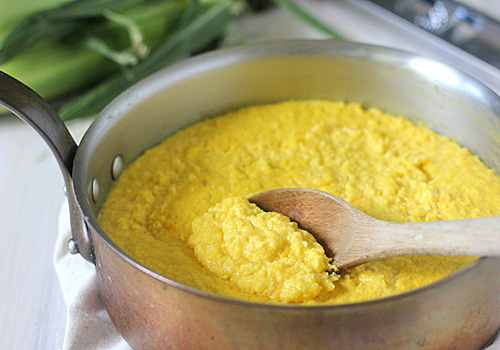 Polenta! so yummy and versatile! Corn casserole is my favorite. Can't wait to try your creamed corn recipe. I follow you on Facebook and get emails. My favorite corn recipe is grilled basil parmesan corn. I could eat an embarrassing amount of that stuff. My favorite corn recipe is nothing fancy at all...just stove-top popcorn with a little bit of salt! Also, I follow you on Facebook! The best ways are usually the simplest- and off the cob- whether grilled, boiled or however you cook it- is the best. I love corn in a Mexican salsa that sweet pop on you tongue behind all the pepper and spice is heaven as far as I'm concerned! Great giveaway btw, I've never even heard of a tool like this before, would have come in handy before I picked up a dreadful can of creamed corn which as far as I could tell looked and tasted like hazardous waste....yuck! So making my own with this if I win!! Corn fresh from the garden and a little butter and I am happy! Yum! I love corn chowder - fresh corn just can't be beat. Is there a better way to eat corn other than fresh off the cob? If I can keep from eating it in the garden, I love to grill it and sprinkle a little Parmesan on top. Oooo! But this handy gadget will save time and fingers when it's time for preserving. For Sunday dinner today, I made this creamed corn with my new gadget. It was FABULOUS! I used the huge stainless bowl I use when assembling my salad in a jar so all the mess was contained. Once I got the hang of it, getting the corn off the cob went fast. I can't wait to do it again. Think it will make a great Thanksgiving tradition. Thanks again. Yeah for creamed corn and yeah for Sunday dinner!! Thanks, Paula!